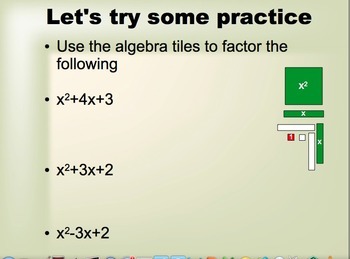 In this SmartNotebook lesson, students will use their understanding of factoring to review some application-based problems, and apply it to create a set of step-by-step "rules" for factoring the simplest quadratic expression: x^2 + bx + c.
Students review factoring both algebraically and with algebra tiles as tactile aids, and an assessment activity using exit slips is provided for them to complete at the end of the lesson. If time permits, there is an interactive whole-class rotary activity for students to use. 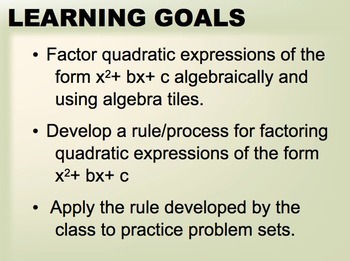 This will give them constant reinforcement of the rules for factoring, while giving them the opportunity to self assess their abilities with each of their classmates. 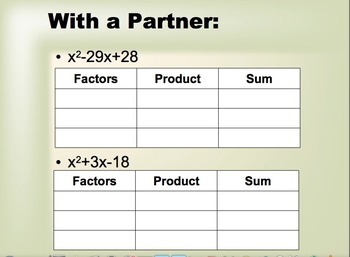 For additional help with this lesson, have a look for my "Factoring Simple Quadratic Expressions Lesson Plan" in my product library.